Preceden is a web-based timeline maker that is used by thousands of students and teachers to create historical timelines. Below is an overview of the process for both you and your students. You don't need to remember any of this; we'll walk you through these steps again after you sign up for an account. You can sign up for a teacher account on Preceden's homepage - make sure you select that you plan to use Preceden for teaching on the sign up form. Preceden will then walk you through how to create a timeline. You're welcome to play around with it for as long as you'd like. Note that if you eventually choose to share your account with your students, the students will be able to see all of the timelines that you have created, regardless of whether you marked them as private or not. Marking a timeline as private means that people who are not signed in to your account will be blocked from seeing it. As you'll see below, because your students will be signed in to your account they are able to see your timelines. Allowing you to create an unlimited number of timelines of your own with an unlimited number of events. Adds the ability to share your account with your students. We've tried to price Preceden affordably so that teachers can pay for it out of pocket. We use your payment money to keep Preceden running for you and other teachers. If you can't afford a pro account please email help@preceden.com and we'll upgrade you for free. First, create one or more classes to keep your students organized. Organizing your students by which class they are in will make it easier to review the timelines they have created. Next, set a student access password. In order for a student to sign in to your account they will need to know something called a student access password. A student access password is a password that you set up, just for your students, so that they can sign in to your account. By signing in with the student access password (and not your normal account password) Preceden will recognize that they are one of your students and not you, the teacher. You should never give your students your normal account password. Otherwise, when they sign in, they will have full administrative privileges which would let them accidentally delete your entire account and all of the timelines in it. We recommend using something simple that your students will be able to remember easily. 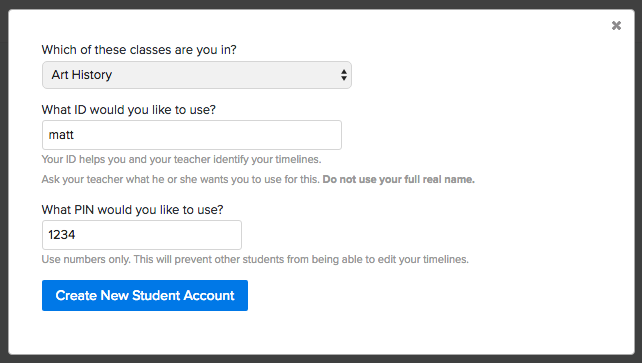 After you've added a list of classes and set a student access password, your account is ready for your students to use. Important: The Children's Online Privacy Protection Act prevents us from allowing any student who is under 13 years old to enter any of their personal information, including their name. Therefore, if a student is under 13 they cannot use any part of their name for their ID. If you have students who are under 13, we recommend telling them to use their student number as their ID. If they do not have a student number then simply assign each student a unique number (1, 2, 3, and so on) that they can use to identify themselves. Each time the student signs in to your account he will have to enter his ID and PIN in order to edit his timelines or to create new ones. 7. That's It! It's Time to Create Timelines! Now that your student's have created an account they'll be able to create their own timelines. The timelines that your students create while signed in to your account will always be private; you will be able to view them while signed in to your account as a teacher, but they will not be able to view each other's timelines. S tudents can't see each other's timelines. There's no limit on the number of students or number of timelines they can have, though if you plan to have more than 50 students please contact us to let us know. If you have any questions about any of this please don't hesitate to contact us at help@preceden.com.